Abarth & Co Black & Silver Shield Stickers. 3" or 4" Pair. Abarth & Co Classic Style Scorpion Shield Stickers. Set of 4. 20mm or 40mm. Abarth & Co Classic Style Shield Stickers. 3" Pair. Abarth & Co Dealer Stickers. 5.5" Pair. Abarth & Co Large Document Holder/Toolbag. 10" or A4. Abarth & Co Old Style Delicate Shield Static Cling Window Stickers. 55mm Pair. Abarth & Co Old Style Delicate Shield Stickers. 30mm, 65mm, or 70mm Pair. Abarth & Co Red Scorpion Wheel Centre Stickers. Set of 4. 50mm. Abarth & Co Scorpion Shield Stickers. Set of 4. 40mm. Abarth & Co Scorpion Shield Style Laser Cut Magnet. 1.5"
Abarth & Co Servizio Service Sticker. 2.5". Abarth & Co Shield Wheel Centre Stickers. Set of 4. 50mm or 60mm. Abarth & Co Silver Scorpion Wheel Centre Stickers. Set of 4. Various Sizes. 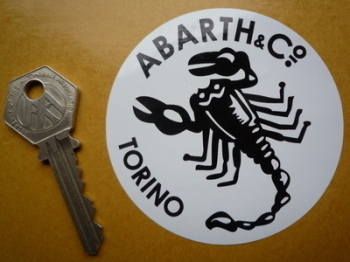 Abarth & Co Torino Black & White Circular Sticker. 3". Abarth & Co Torino White & Clear Circular Window Sticker. 2.5". Abarth & Co Torino White on Black Circular Sticker. 2.5". Abarth & Co Tune Sport Shield Stickers. 3" or 4" Pair. Abarth & Co Turin Dealer Window Sticker. 5.5". Abarth & Co. Fiat. Flag & Scroll Sticker. 4". 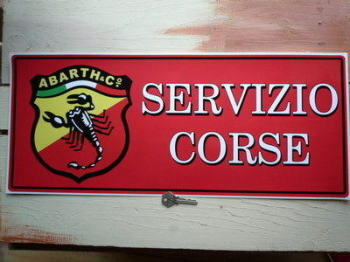 Abarth & Co. Servizio Corse Red Workshop Sticker. 23.5". Abarth Agip Service Sticker. 4". 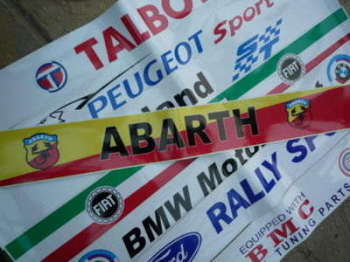 Abarth Agip Stickers. 3" Pair. Abarth Black & White Shield Stickers. 2" or 3" Pair. Abarth Cut Vinyl Scorpion Stickers. 4", 6", or 7.5" Pair. 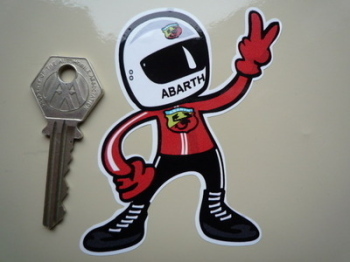 Abarth Driver 2 Fingered Salute Sticker. 3.5". Abarth Flames Handed Stickers. 6" Pair. Abarth Italia Tricolore Style Stickers. 2" Pair. Abarth Martini Racing Triangle Sticker. 4" or 6". Abarth Parking Only. London Street Sign Style Sticker. 3", 6" or 12". Abarth Red & Yellow Sunstrip Screentop Decal. 52". Abarth Round Shield Stickers. 65mm & 70mm Set of two. Abarth Scorpion Black & White Circular Stickers. Set of 4. 45mm. 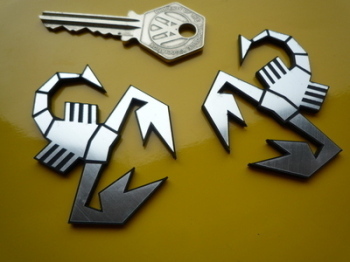 Abarth Scorpion Laser Cut Self Adhesive Car Badges. 2" Pair. Abarth Scorpion Logo Chrome Style Stickers. 45mm Set of 4. Abarth Scorpion Metallic Red & Black Circular Stickers. 60mm Pair. Abarth Scorpion Red on Silver Circular Stickers. 57mm Pair.